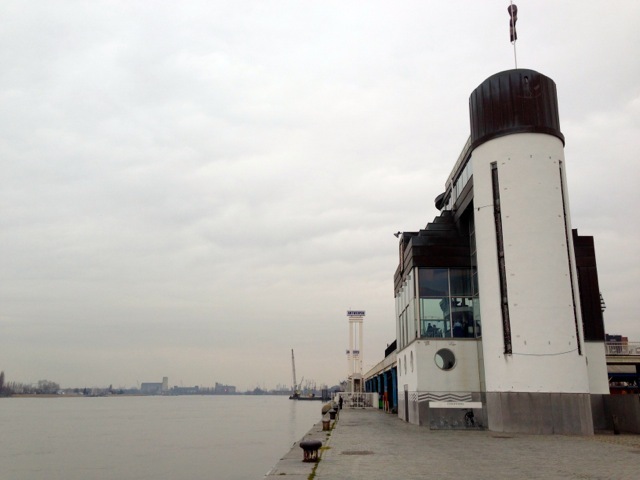 I visited Antwerp in December as part of a business trip to Brussels. 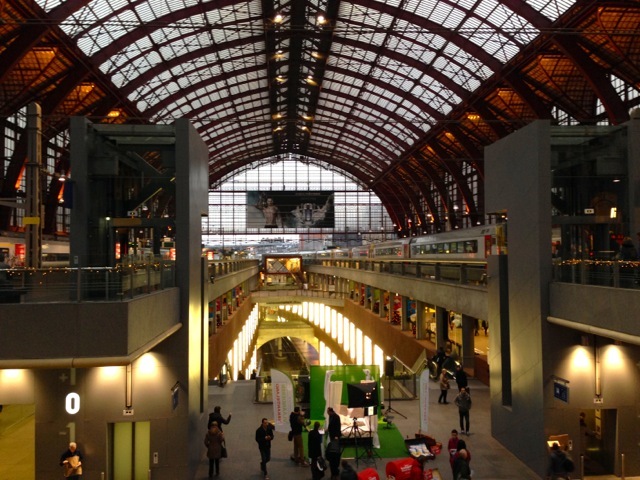 Antwerp is only about a half-hour from Brussels Airport and there are about two trips per hour from the Brussels Airport train station. 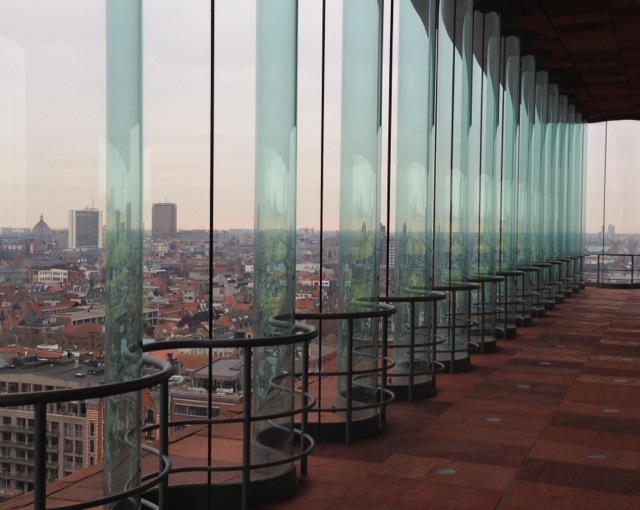 MAS Museum Antwerp – view from one of the sky lobbies. 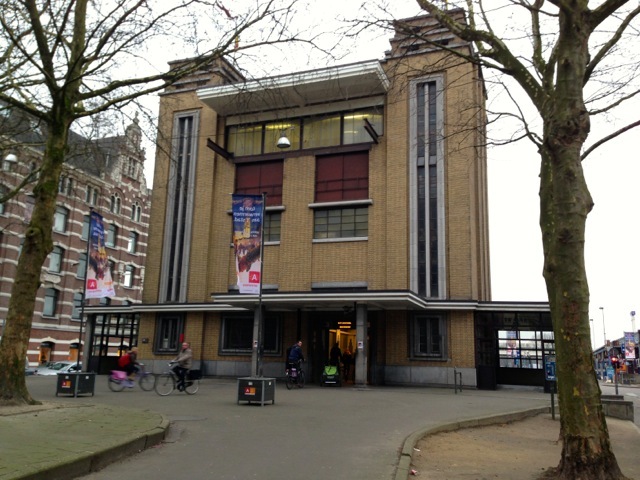 The main purpose of my trip was to visit the Museum aan de Stroom (MAS). 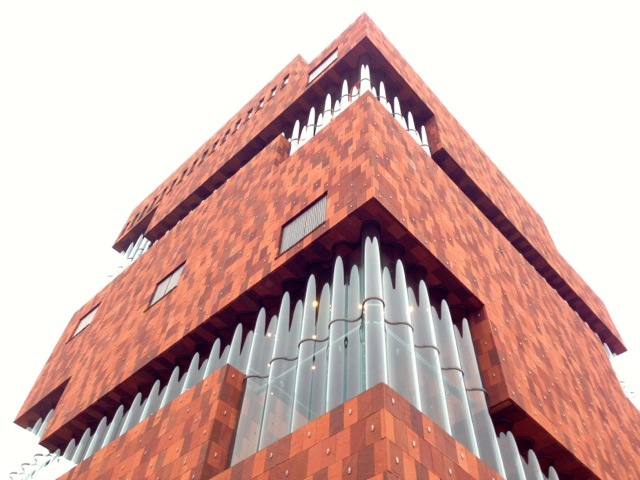 The MAS museum “tells the story of the people, the past, present and future of the city of Antwerp and the world.” The building, as you can see from these photos is really spectacular. There are changing exhibits and permanent exhibits about the city and port as well as some more esoteric subjects. You can ride the escalators up the building to a lobby on each floor without paying admission. From the 9th floor you can walk up a set of stairs to the roof where there’s an outdoor area with spectacular views of the city and river. It’s a very neat museum and experience. 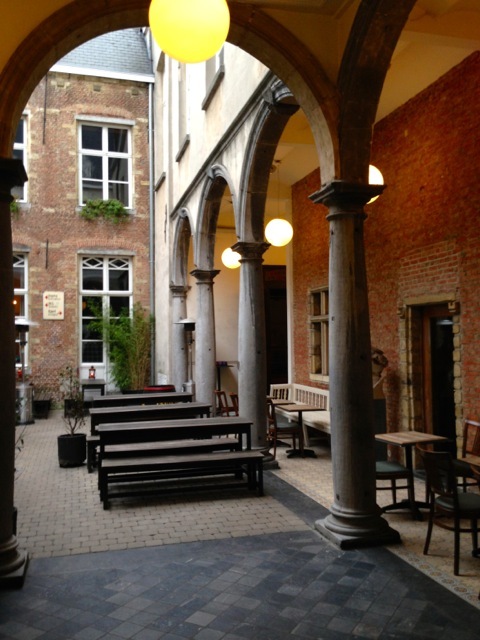 De Groote Witte Arend Restaurant Antwerp – courtyard. Next I had lunch in a restaurant called De Groote Witte Arend (Flemish only website) which specialises in Belgian cuisine and beer. It’s on the other side of the historic city center from the MAS museum, about 15-20 minute walk. The building is quite old, there’s a short history at the back of the menu. For many years it was a nunnery and there is still a chapel off the side of the courtyard. The restaurant has several rooms arranged around the courtyard. It was quite quiet at late lunch on a mid-December weekday, but I can imagine it being a lot of fun when it’s crowded. Carbonnades at De Groote Witte Arend restaurant Antwerp. 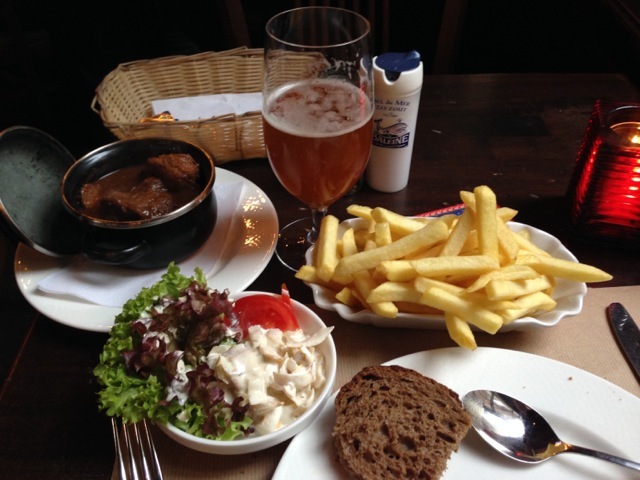 I ordered one of my favourite Belgium meals: carbonnade (or: Vlaamsche Stooflees in Flemish). It’s beef stew cooked in the local dark beer and is said to be the national dish of Belgium. Generally served with “Belgium” fries, here with a chicory salad too. The version here was the best I have ever had, the beef was cooked just right and the fries were just out of the cooker, the salad was a great counterpoint. One of the best meals I ate all year! I drank a De Arend blond beer with it. The waiter was extremely friendly and helpful (in English) in helping me pick a beer. In short, a great place to visit for the food and the beer! After lunch I walked over to the river, it was a very grey day, but it’s always fun watching the water go by. There’s a beautiful art deco building that serves as a boarding ramp for large passenger boats, now there’s a restaurant inside too. It has great Antwerpen signs. 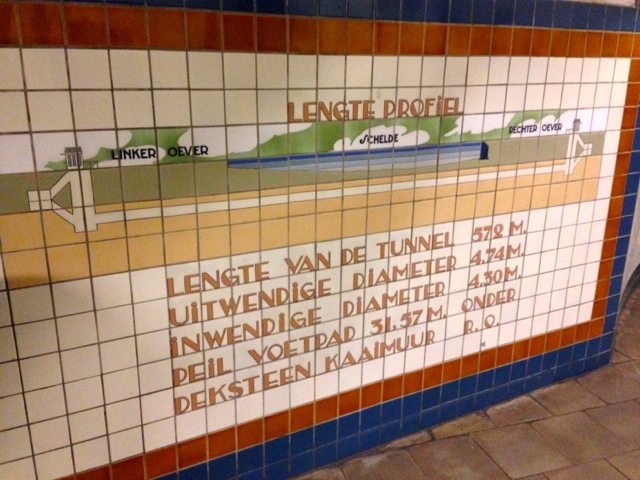 Tile diagram of St Anna Pedestrian Bike Tunnel Antwerp. Next I walked across the street to the St Anna pedestrian – bike tunnel located at the Sint-Jansvliet square (end of the Hoogstraat). 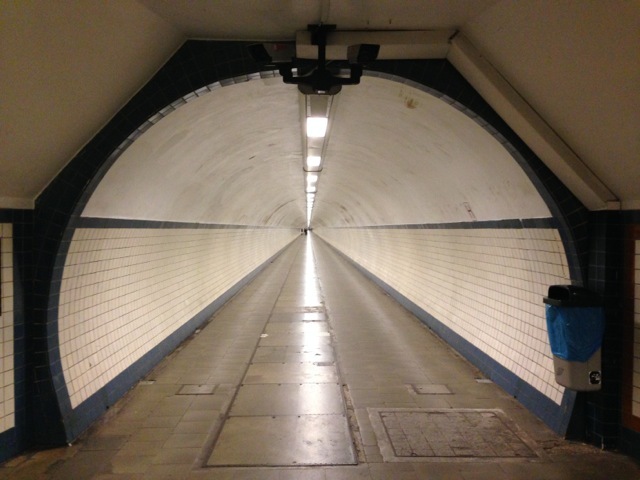 This historic landmark is a 572 meter long tunnel under the Scheldt river. It was built in 1931-1933 to link the old city centre with the settlement on the left bank of the river. The building looks like the Battery Tunnel entrance in Manhattan and so I fantasised about filming a Men in Black parody here … They have preserved the wooden escalators, but there’s also an elevator for bikers. Quite neat. I walked back through the old city to the Central Railway Station. 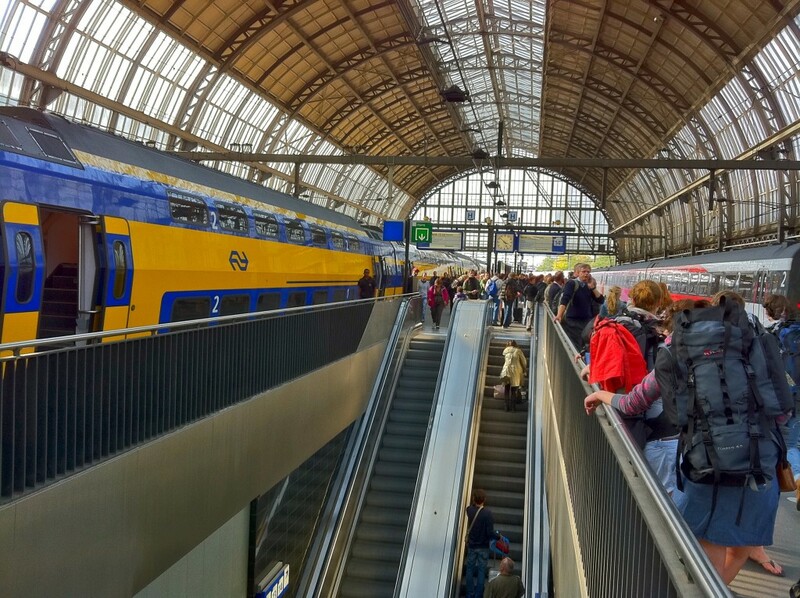 The station has been renovated in recent years to allow trains to travel through on their way from Brussels and south, to Amsterdam and north. I visited while it was under construction several years ago, but now it’s finished and it’s wild. At least four levels of trains plus connections to the city’s metro system. 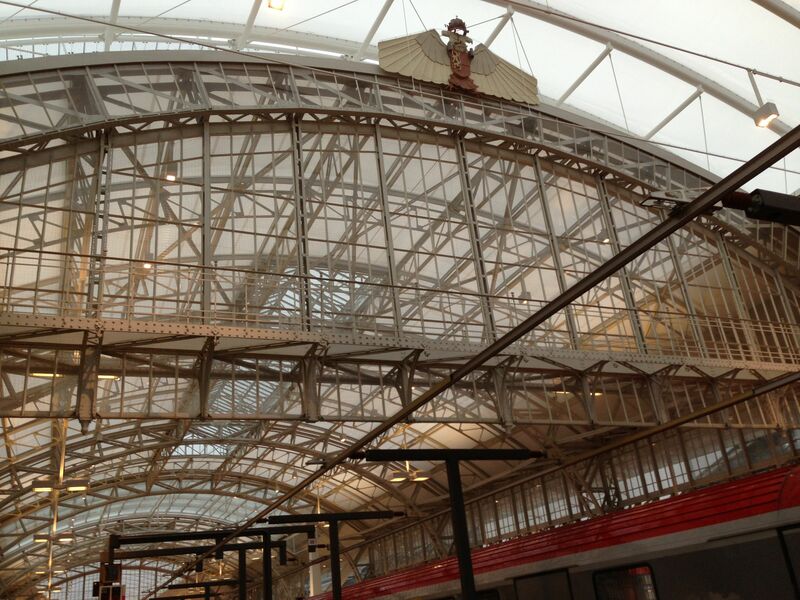 They managed to keep the historic train shed – beautiful – and headhouse building. 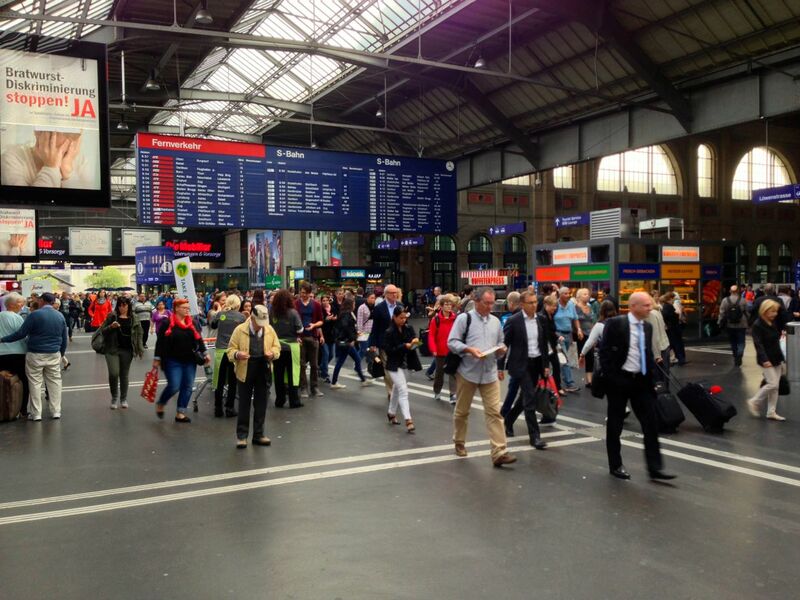 The photos here do not do the station justice, it’s very hard to photograph … just visit it! The trip back to Brussels took about half an hour (we did not go via the airport station). By the way, it was very easy to buy my railway tickets on line at the Belgium railway’s website www.belgianrail.be. Check out soundbitecity blog’s post Beer City Antwerp about Antwerp brewery DeKoninck and restaurant café Pelgrim across the street … they’re on my list for next time! Here’s a link to my flickr photos of Antwerp. Here’s a link to a map with my flickr photos flickr Antwerp photos map. A colleague from San Francisco was in town last week and, as usual, visitors call attention to the things you don’t always notice as you go about your everyday business. I have been following his blog (Jarrett Walker, www.humantransit.org) and added a couple comments and then thought, well one of these comments is something I’ve wanted to write about myself for a while, so here’s a first installment on Otto Wagner and his influence on Vienna transportation planning. Otto Wagner is a fascinating example of an architect who also did some great urban civil engineering. There is a nice exhibition of his work at the Wien Museum’s Otto Wagner Pavilion located in the Karlsplatz U-Bahn entrance (designed by Wagner). The museum is very small but manages to present a good summary of Wagner’s work. Also don’t miss his Hof Pavilion (German website, nice photos) a private station designed for the Kaiser at Schönbrunn (the Kaiser’s summer palace). The Hof Pavilion is adjacent to the Hietzing U-4 station (one station beyond the Schönbrunn station). It’s only open at limited times so check the website. It’s well worth the visit for fans. Of course you can still see Wagner’s influence in the design of many stations on the U-4 and U-6 lines. Both these lines were operated with steam engines in Wagner’s day (he developed the conceptual plan for these lines as well as designing many of the stations and infrastructure). 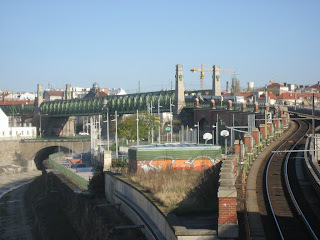 The photo on the right is of his famous bridge on the U-6 line over the Vienna River at the Gürtel. The photo is taken from the U-4/U-6 Längenfeldgasse Station. Wagner’s lines were later converted to electric trains then into Vienna’s U-Bahn network, but many stations were maintained and have been renovated. The photo on the right is a detail of Wagner’s bridge on the U-6 line. All photos are on my Otto Wagner Flickr Photo Album, where there are many more photos of Otto Wagner stations and bridges. Vienna has done a wonderful job restoring many stations designed by Wagner. A couple years ago they rehabilitated the Gumpendorferstrasse Station (U-6) – shown at the top of this post. They did a great job integrating new features (e.g. elevator) and new floor tiling (rubber non slip) that matched the old style. It is great that Vienna does not eliminate history from their transportation infrastructure in the name of efficiency or current fashion. As places like NY Grand Central Terminal show, old pedestrian flow designs often work much better and the buildings are much more gratifying as many modern designs.